Not all moving companies are the same, and not all moving companies in Philadelphia PA are willing or capable of moving large houseplants. At Suburban Solutions, in addition to moving standard items such as moving boxes of household goods and furniture, we can also safely transport your plants. This includes large, heavy, and delicate plants and interior trees. Call us to learn how Suburban Solutions is one of the premiere moving companies in Philadelphia PA because of the services we offer. Moving Company FAQ: How can I move my houseplants? Plants are not like other household belongings. They cannot be secured in foam or bubble wrapping, and boxed up for days. Furthermore, each state has its own regulations on transporting plants, particularly when crossing state lines. This means you may not be able to load them in a car or truck and move them to your new home. When researching moving companies in Philadelphia PA, ask if they transport plants and trees. How can I move my houseplants? Before you decide that you have to bring your grandmother’s fern or husband’s orange tree with you, it’s important to consider two things: the legal regulations and the right growing conditions. The following is additional advice on how you can move your houseplants. State Laws Vary. Many states allow you to import plants that have been placed in sterile soil. However, there is a small number of states that don’t allow certain species. For example, California doesn’t allow any kind of citrus plants to be brought into the state. California also restricts the importation of fruit, nut, pine, and oak trees unless they have gone through a quarantine period. Likewise, Hawaii has a lengthy list of plants that are strictly prohibited from importation. Contact Suburban Solutions to learn if we can transport your plant or tree to your new home. Among your choices for moving companies in Philadelphia PA, Suburban Solutions is dedicated to providing the ultimate in customer service. Check the Growing Conditions. Not all plants thrive in every condition or environment. Even indoor plants can be affected by dry or humid conditions. Before moving your plants, be sure to factor in the hours of sunlight in a day, the frequency of rainfall, and overall plant hardiness. You may need to water them in advance of moving day. Shipping Plants. Unlike Suburban Solutions, many moving companies in Philadelphia PA will not ship plants in their trucks. Call us at Suburban Solutions as we are eager to assist you with all of your moving needs. Moving the Plant or Tree. If your new home will not have the space to accommodate your plant or tree, consider taking a cutting with you instead. The cutting should be kept moist in wet paper towels. If you would like to know more about shipping live plants, we encourage you to contact one of the team members at Suburban Solutions. We’ll be happy to answer your questions and provide you with the solutions you need. 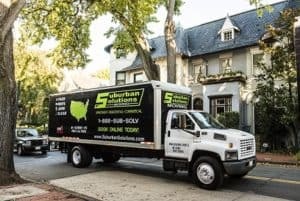 Suburban Solutions aims to be the first choice for moving companies Philadelphia PA residents rely on for quality services.